The sock cuff on the right is shorter than the one on the left, but about four rows longer than it was when I found it. It still feels...weird. Strange. Inserting my needle in her stitch, moving her stitch off...adding an entire row, then another, so all the stitches on the needles were those I'd made. Like extending the rows in a carefully designed but unfinished garden, or painting a border on the bottom of a picture. And yet very satisfying. These were her needles (all but one--I switched to five-needle system I use now), and what I touched, her hands had touched. Every stitch bound her work and my work together like nothing else I ever did with her. There was a lot she didn't teach me about knitting in the round (only that it took at least four needles, three to hold the work and one "traveling.") I discovered that she arranged ribbing stitches on the needles the same way I discovered worked best to prevent laddering: start each needle with the knit stitches, end with the purl stitches. 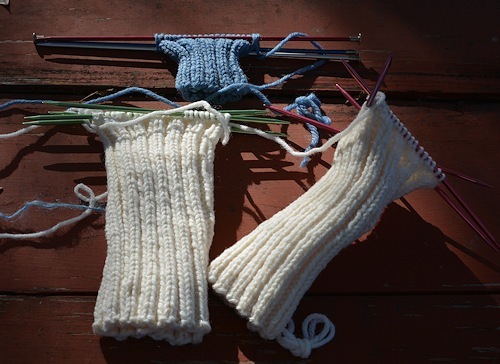 Though she appeared to be knitting with just three standing needles and one traveler, she had left both cuffs with four needles in--with the split at the start of the row, mid-back. There's a certain awe about trying to finish something my mother made--she made so many beautiful things--but also a lovely feeling of connection through generations. Yes, Mother, your daughter finally got her act together and can make useful things with needles and string. 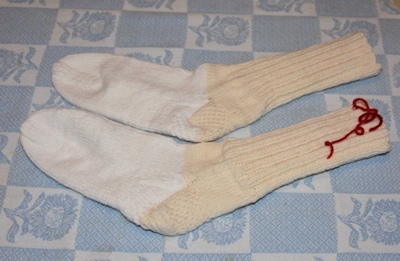 It turned out there wasn't enough of the cream-colored yarn to finish the socks, so I had to finish them in white. There's there's a 1/8 inch difference in some areas of the socks, so I marked one--that way the recipient could then tell me which she preferred when I made her another pair. I should have taken a picture next to one of the socks I make for myself, to show the difference in size, but...too late now. I know my mother had some unfinished knitting projects at one time. I wonder if they are still around. I knew about a big crochet project she had about half-finished, but I couldn't remember enough crochet to go on with it. This, though--ribbing, socks--this I can do. I'm glad you are feeling the connection and I hope the socks are something that someone you care for can get a lot of use from. I hope so. I have someone in mind, if it suits her. Moments like this are so precious. Yes...the unexpectedness is part of the sweetness. It certainly was. There might be other projects to find, too, that I wouldn't be able to finish (sweaters...) but to find something I *could*...and I'd so much rather put feet on these socks for someone else than unravel the yarn and use it to make socks that fit me. I have a sort of similar story. I have this knitted afghan that my paternal grandmother made me. It's "grown" over the years and is now more than six feet long (I should measure it sometime). It's been well-loved and has had holes gnawed in it by guinea pigs (which I am now capable of fixing properly) and is definitely a source of comfort when I'm feeling sad. I was two years old when my granny died, and a number of years ago I learned that she hadn't actually been able to finish the blanket before she died. My maternal grandmother actually completed it, using crochet to join three large coloured blocks with a ruffle stitch, and adding a shell stitch around the edge of the entire thing. My grandparents were all friends; my parents knew each other as children. 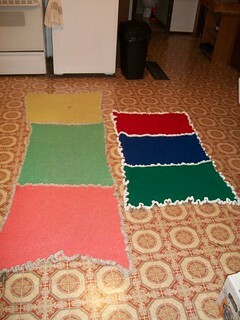 I managed to reverse engineer my afghan, and so far I have completed two similar blankets. One has been given to my eldest niece, who is now seven, and the other will be given to her younger sister (four years old) at Christmas this year. I'm working on one for their little brother, who is two, and then I'll make one for my own child (due in February) and then my nieces' youngest sibling (due in March). Working on these blankets makes me feel more connected to my grandmothers; my maternal grandmother died when I was 13, and she's the one who originally taught me to knit (and to sew). Those are lovely! And what a lovely story, as well. Thank you for sharing it here. While I was working on it, I wondered about the woman who had started it. I hope she would be happy that it is finished, and loved. I'm sure the woman who started it would be happy...just as I'm sure my mother will be happy when the socks she started end up on my friend's feet. As I was knitting away on one of the socks today, I came to a flaw in the yarn--a bad one. Cut that one out, reattached the yarn (and by the way, the older acrylic yarn? Not like wool for the reattaching.) Not too long after, found another bad spot. I suspect a mouse took a taste and decided Orlon wasn't what it wanted--it looks like something sharp made little snips partway through the strand for about an inch, inch and a half.